Timberlost Outfitting is remotely located between Big River and Leoville, Saskatchewan. It is situated in lush northern Saskatchewan boreal forest, approximately 140 miles north of Saskatoon. Saskatchewan Environment has rated this area as one of the best in Saskatchewan based on deer habitat and density. The black bears and Canadian geese are plentiful and well worth the trip to Canada! 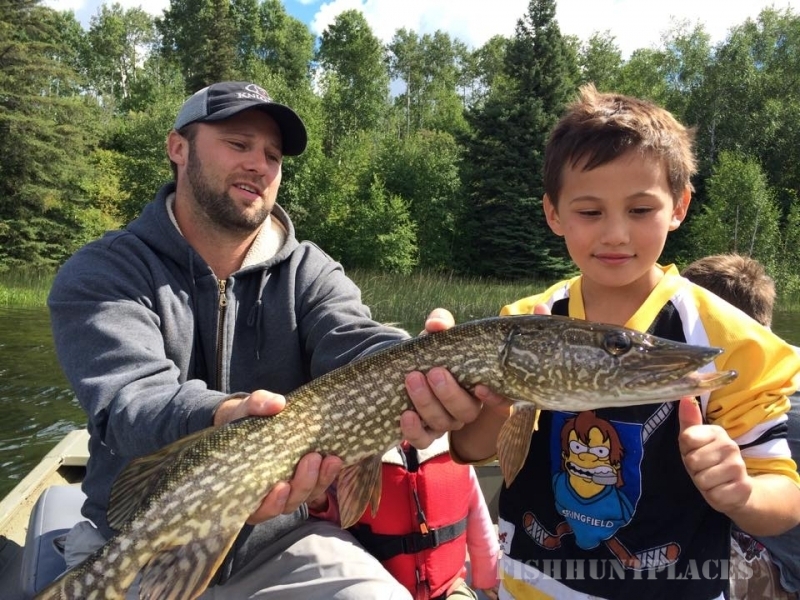 The clear waters of the numerous lakes in the area are teeming with northern pike, walleye and rainbow trout. 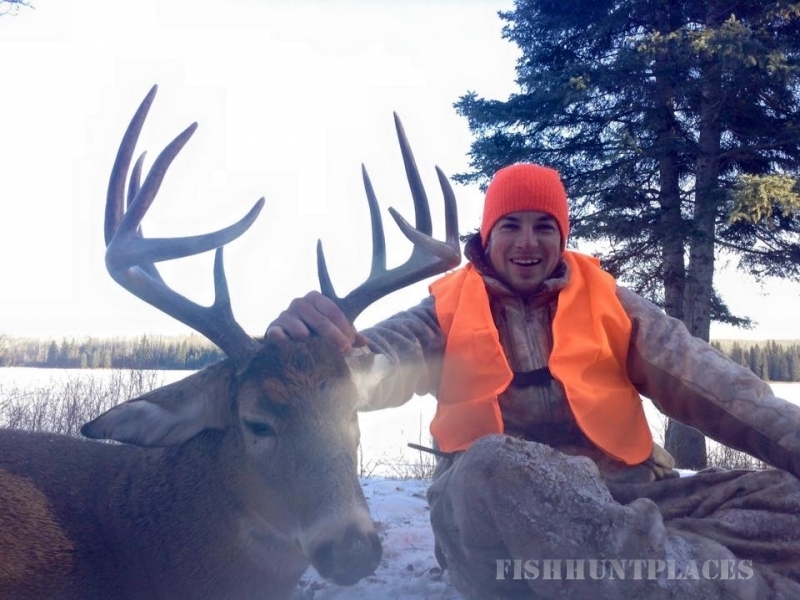 There is ample opportunity for fishing after getting your monster whitetail or big bear. We have thirty four non-resident deer tags on 66,000 acres, twenty non-resident bear tags on 88,000 acres, twenty farmland bear tags, and do migratory game birds. 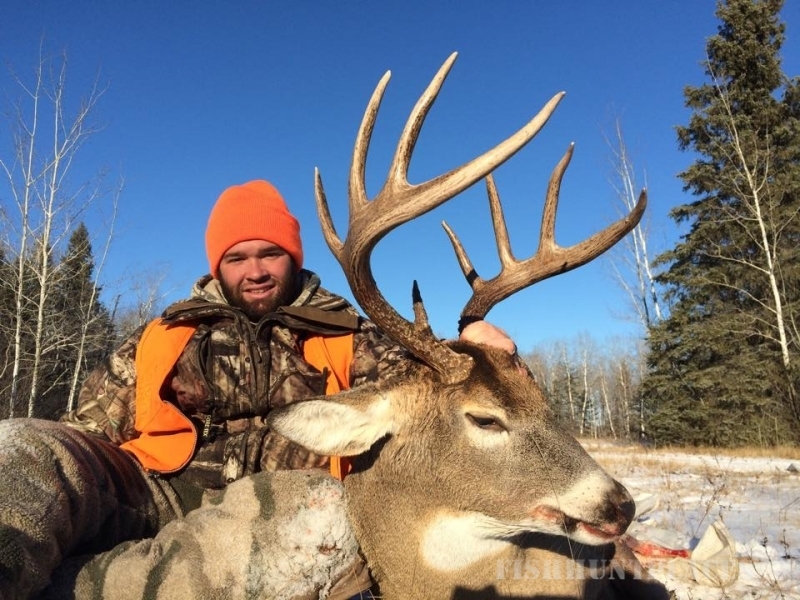 Timberlost Outfitting offers fully guided Saskatchewan, Canada Trophy Whitetail Deer Hunting. 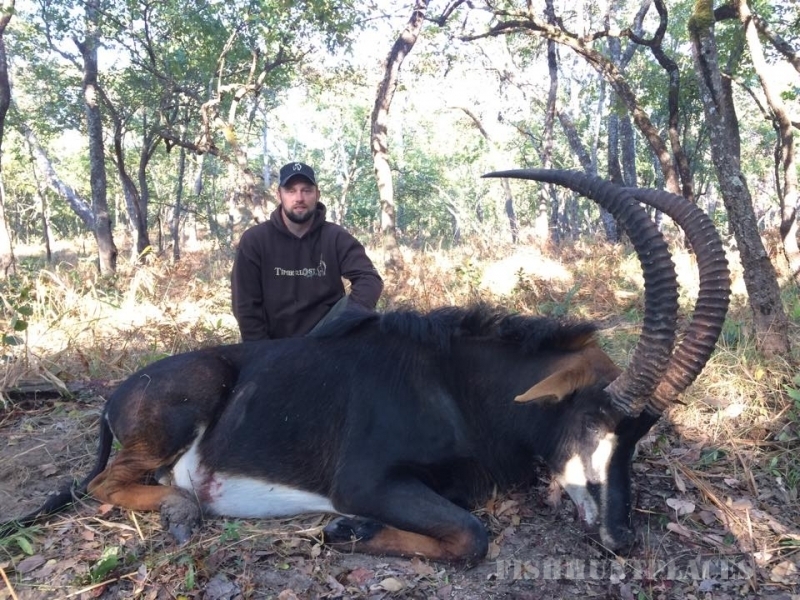 Timberlost Outfitting is a Trophy Hunters paradise due to the good genetics, perfect habitat and few hunters, offering great opportunities for bucks over 170". 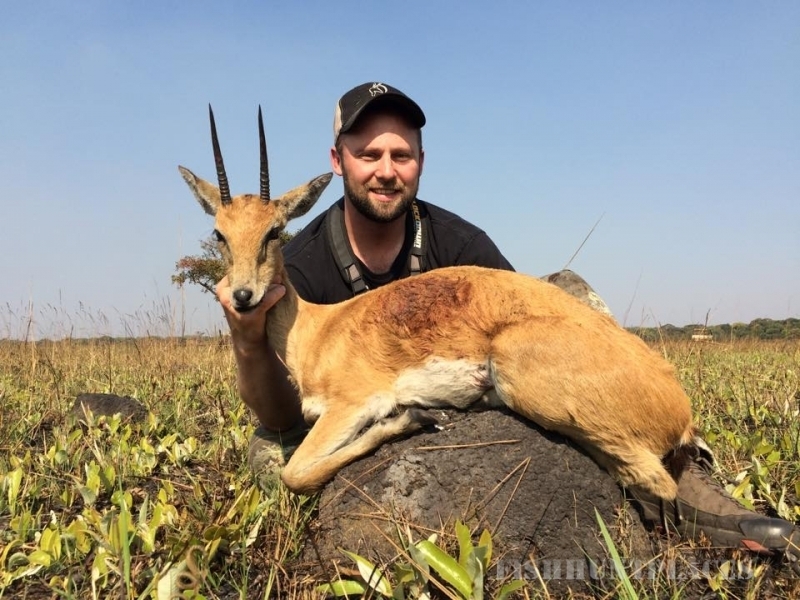 Firearm hunts and archery hunts are offered on a limited basis to maintain a low pressure hunting environment. We have 34 deer tags on 66,000 acres, but may not take 34 hunters if the deer herd appears that number of hunters may not be sustainable to produce trophy bucks. I have an intensive feeding program; I don’t just feed the deer just to get that one buck big buck, I feed them to keep the whole herd healthy. We have around 40 baits station throughout our whole area and try to keep the stands around 2 kms apart with trail cameras going 24 hours a day 7 days a week. 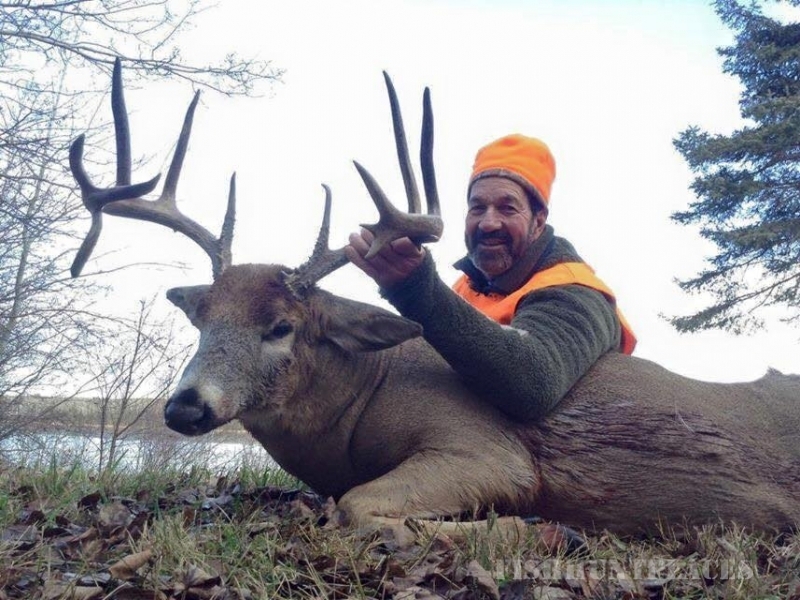 We have a lot of repeat hunters with us and after discussing with them, we have decided that if a hunters doesn’t squeeze the trigger, Timberlost will give him back $1000, and if any 10 point buck is shot that does not gross 140 inches there will be a $1000 fine in order to promote world class bucks. Best herd management practices, maintaining year round nutrition with various mineral and salt licks, and predator control ensure our trophy whitetail deer develop to their fullest potential. 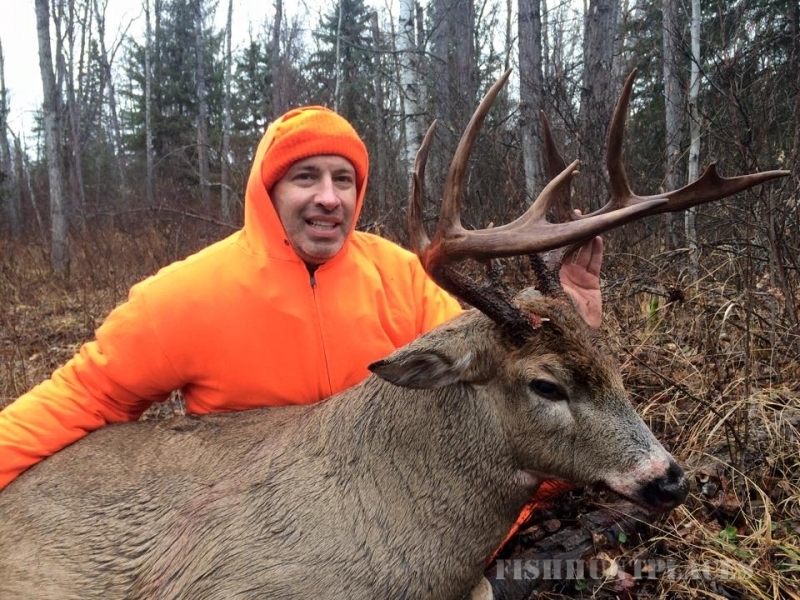 Whitetail Deer hunts are $4995 plus licenses (around $360). Cost includes meals, lodging, trophy prep, taxes, pickup and drop off in Saskatoon. The hunts are 5.5 days and we require half down for a deposit and the remaining balance to be paid 2 months prior to coming on the hunt. Licenses can be paid in cash when you arrive at camp since the government sometimes changes the price. Our area is the first stop on the largest migration corridor in North America. Virtually all the land north of us is forest. The rich agricultural belt that spreads south begins at Timberlost Outfitting. The location is PERFECT for goose and duck hunting as we get the first shots at the flocks flying south so they decoy in great. Each year the sky fills with migrating waterfowl eager to replenish their energy stores. The sheer numbers of ducks and geese is truly something to witness. 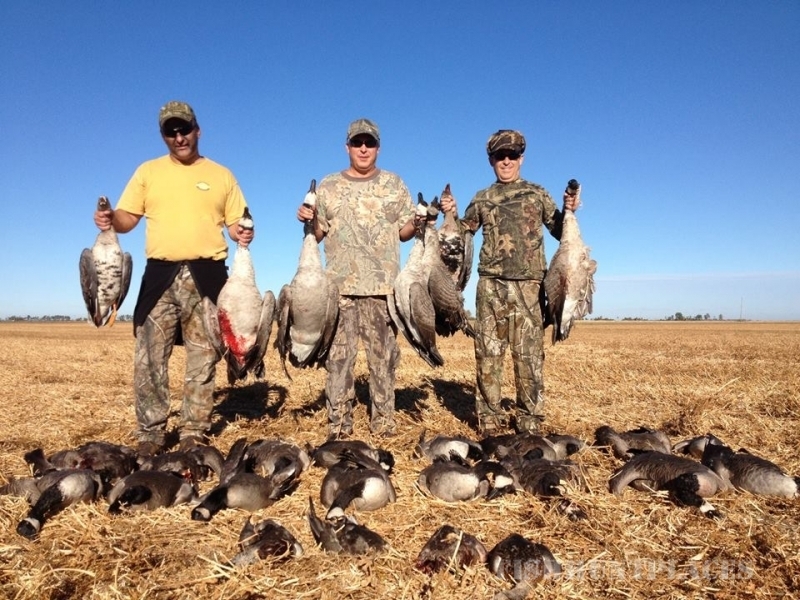 Canada Goose hunting and Snow Goose hunting is typically in the mornings, and duck hunting (or grouse hunting) is usually in the afternoon both over fields. 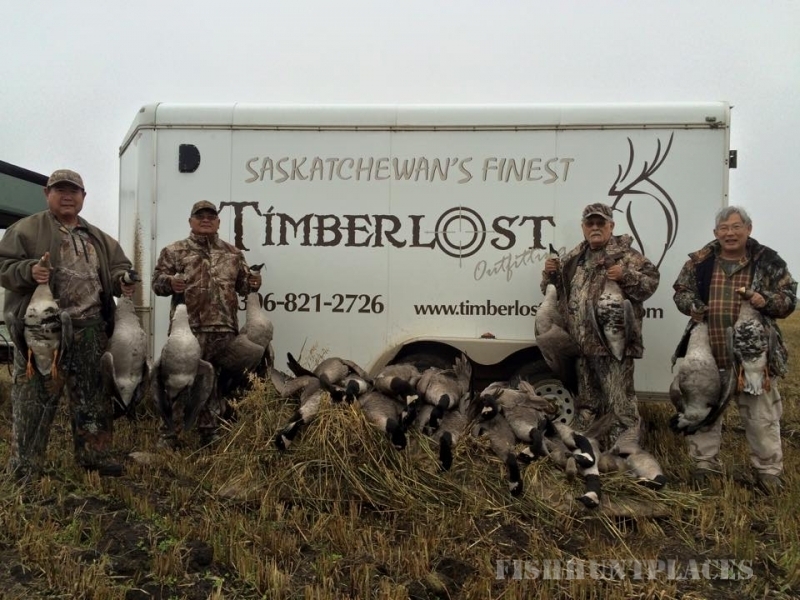 Our waterfowl guides have access to hundreds of square miles of the best goose hunting and duck hunting in Saskatchewan. Having grown up along side the farmers in the area we have a healthy relationship with them and have access to thousands of acres of prime hunting. The most important component of a good waterfowl hunt is spotting, which is why our intensive spotting program is the backbone of our success. We spend many hours spotting each day, drive countless miles every week and put in many phone calls to the farmers to ensure that you are hunting the best possible fields. Choosing the right waterfowl outfitter can be a challenge, we invite you to do your research, keep looking through my website for more information and ask around and you will find that Timberlost Outfitting is the best outfitter in the industry. Contact us anytime if you have any questions or concerns or to ask us for a list of past clients for references. 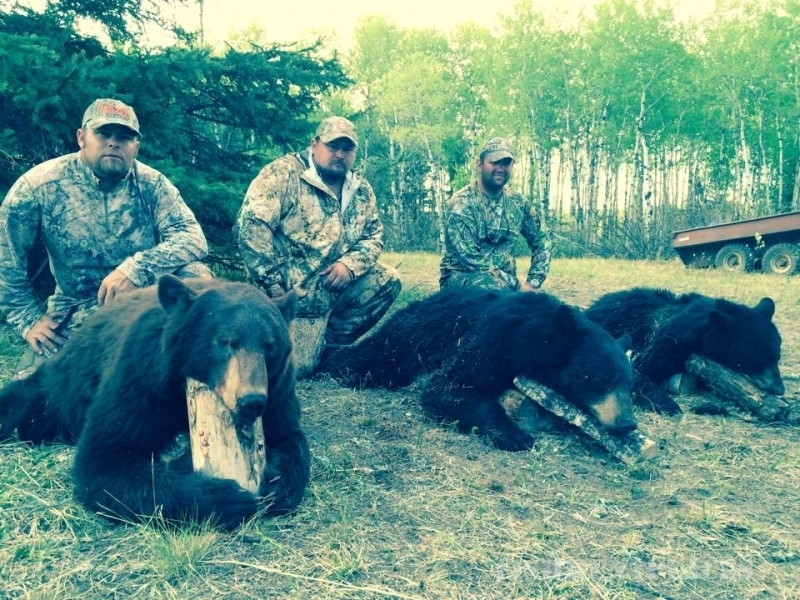 Timberlost Outfitting offers fully guided Saskatchewan, Canada Black Bear Hunting. We have a huge area for forest and farmland bear hunts; Timberlost has 20 forest bear tags on 88,000 acres and 20 farmland land bear tags on 1000 square miles. Our area has some of the most prime bear real estate in the province and country, and we have some of the best fishing around which we do every morning of the hunt. We’ve been seeing sows with four cubs quite frequently which is a sign of excellent habitat and breeding environment. We hunt 20 forest tags and roughly 12 farmland bear tag in the spring and then save the remainder of bear tags for fall spot and stalk in the oat fields. We have around 60 different bait stations that we bait religiously. We have trail cameras on all of our bait stations going 24 hours a day 7 days a week so we know whats coming in, to get our clients their best chance at shooting a mature bear. Every year we shoot a few of those once in a lifetime bears, what I like to call them the 500 pound class, 22 inch skulls. We always shoot a few coloured bears also every year but only if they are mature so they spread the genes around. All of our baits stations are approximately a 20 yard shot, so you can use which ever weapon suits you. We usually get set up in the stand around 4 pm, after a morning of fishing and a hearty dinner. 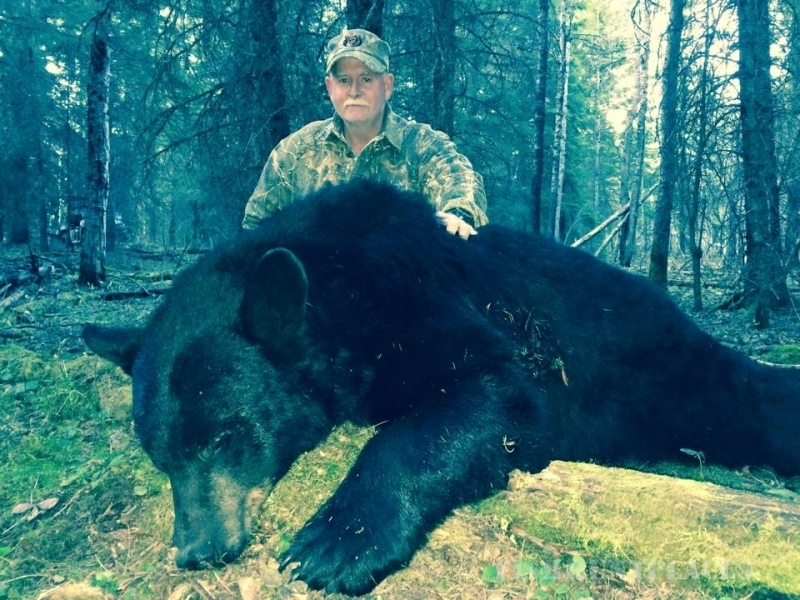 Black bear/fishing hunts are $3200 plus licenses (around $300). Cost includes meals, lodging, trophy prep, taxes, pickup and drop off in Saskatoon. 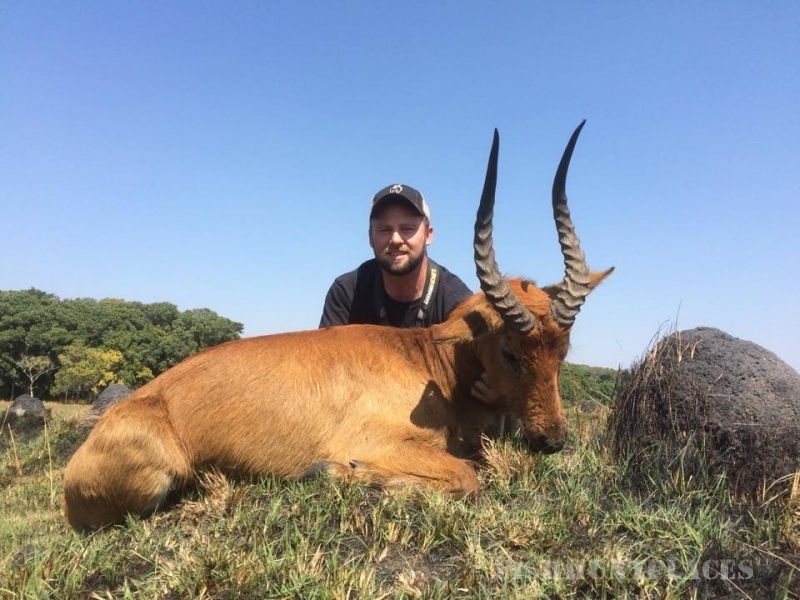 The hunt is 5 days and we require half down for a deposit and the remaining balance to be paid 2 months prior to coming on the hunt. Licenses can be paid in cash when you arrive at camp since the government sometimes changes the price. Timberlost Outfitting drive in fishing trips. Most of all our outfitting lakes are located near Leoville, Saskatchewan. We offer a lot of different fishing packages and are really flexible and can customize any fishing trip thats suits your needs. We have the outfitting rights on many good fishing lakes just to name a few are Chitek Lake, Green Lake, and Huard Lake. We offer Walleye, Northern Pike, Perch, and Brook trout fishing trips. We have a few different options for your fishing trips depending on what you are looking for. We can supply a guide or a cook what ever you would like, or if you want to do everything on your own that is also fine.